Milanese cuisine has its roots in simpler traditions, and that includes reusing old bread to make exquisite dishes. So if you happen to have bought too much bread, you have two options: Freeze it while still fresh and then remove it a few hours before use, or listen to my granny and try one of these six Milanese dishes. 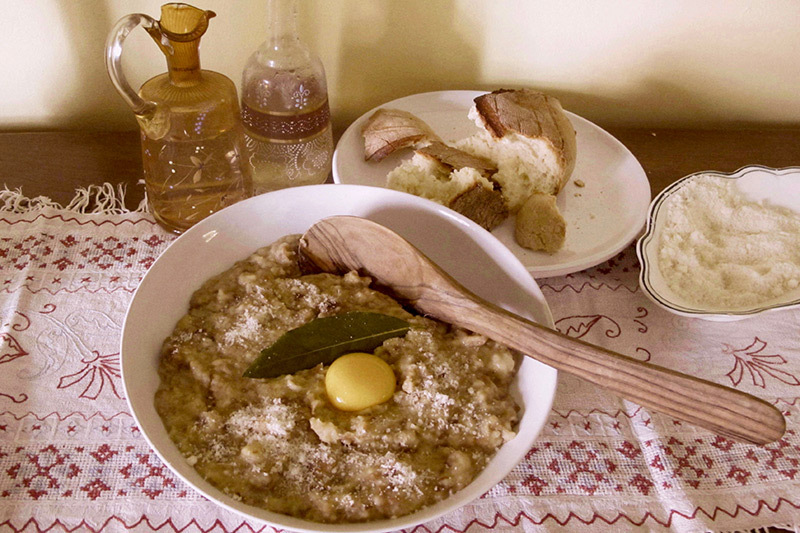 This is a legendary peasant soup described in the 1450 cookbook by Maestro Martino, “The Art of Cooking.” Making the soup is simple: Boil broth, pour in bread crumbs made from old bread and cook for 5 minutes. Meanwhile, whisk eggs with grated Parmesan cheese, add a spoon of butter, pour into the broth, mix and serve. In Milanese dialect, the name means married bread crumbs, because the bread, tired of being left alone, has mated with the egg. Stale bread and water are the inexpensive ingredients for this basic, frugal soup, exceptional for its goodness and simplicity of execution. Pieces of bread are soaked in cold water for a couple of hours (michetta is the best bread, but you can use any other kind). Then add butter, oil and salt and boil. To make it tastier, Granny used to add some beef bouillon and serve with parmesan. Variations and additions are accepted, like the use of chicken or meat broth instead of water, a beaten egg that is stirred in or a garnish of dried bay leaf. But the concept of a simple food remains the same. That pink and juicy mortadella (Italian bologna) is the main star of these oval-shaped patties, made with milk-moistened bread, eggs, chopped parsley, grated cheese and garlic, then seasoned with a pinch of grated nutmeg, salt and pepper. Mix all the ingredients, dip in bread crumbs and fry with a little olive oil and a bit of butter for a beautiful golden color. 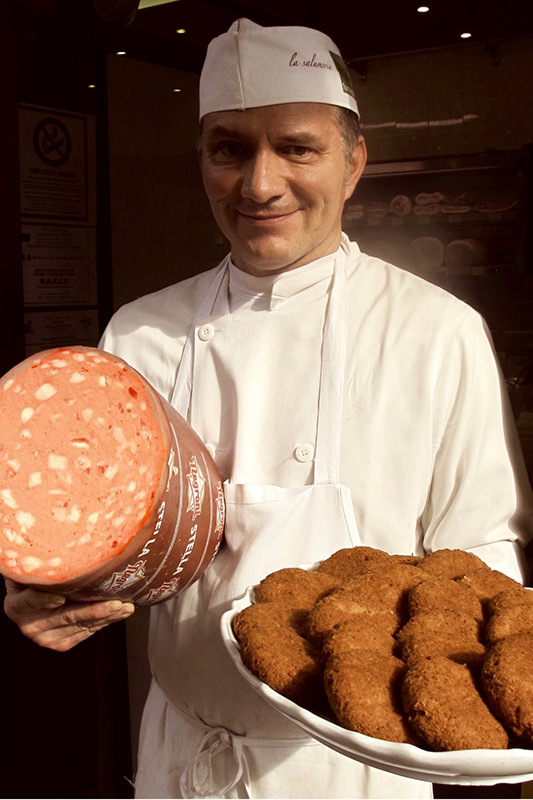 The Milanese frugal cooking tradition continues with the combination of stale bread and leftover bollito misto (mixed boiled meat), or any other kind of meat, such as sausage, wurst or salami. The mondeghili’s origins go back over centuries, up to the Arabian age. 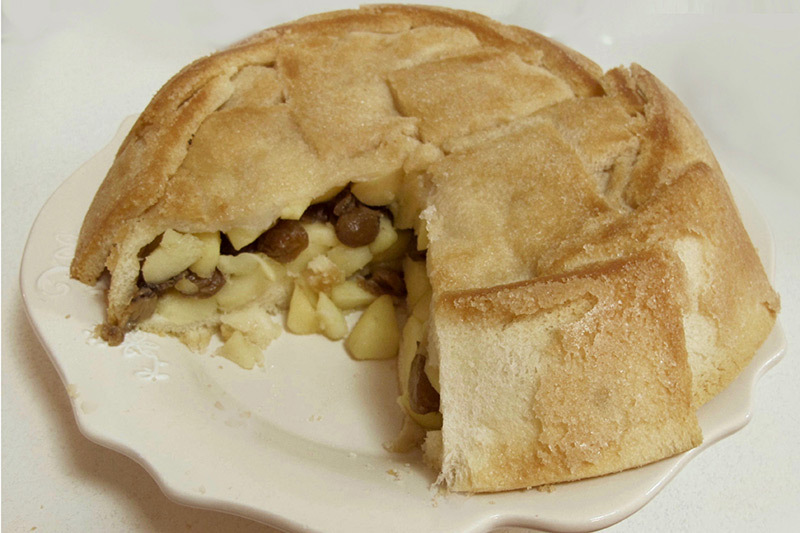 The dish carried over into the culinary tradition of the Spaniards, who dominated Italy for 150 years. Today, these meatballs are often brought to your table as a welcome pre-appetizer, or you can find them as street food. 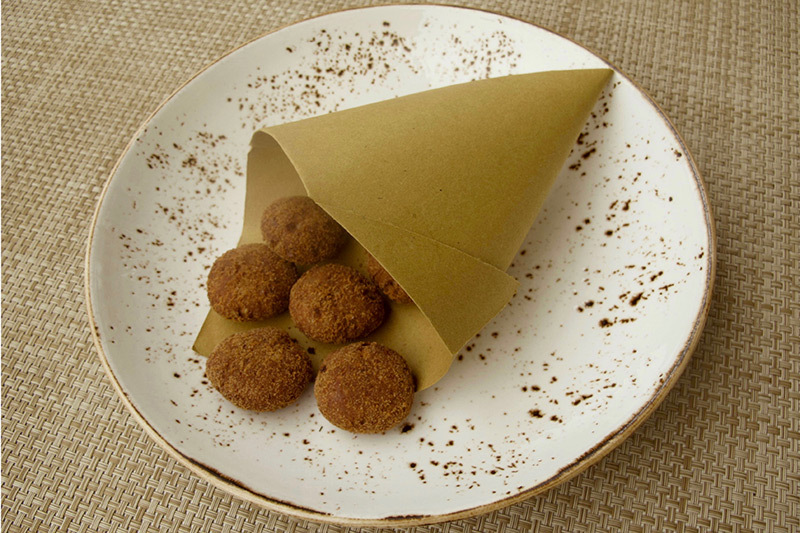 They are similar in preparation to polpette, but are walnut sized, rolled in bread crumbs and then deep-fried with sage and butter. You can make a no-meat version, choosing to enrich these fantastic tidbits with fillings such as smoked cheese or fried zucchini. This is a wonderful alcohol-drenched pudding, named after the British Queen Charlotte, who apparently loved to have apple trees in her garden. Charlottes are usually more complex, but the Milanese version is all about simplicity. Once the bread’s crust is eliminated, the inside is used to line the bottom and the sides of a butter-greased mold. 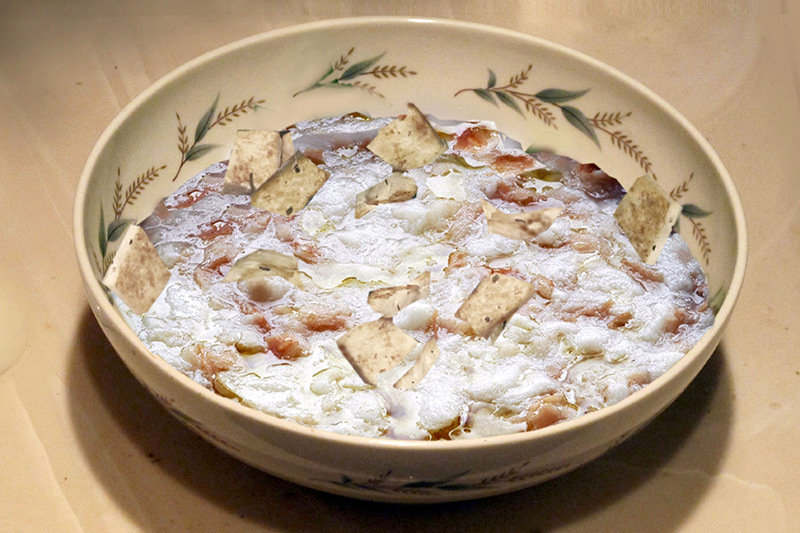 The center is filled with apples, raisins, pine nuts, zest of lemon, white wine and sugar, and baked for an hour at 350 F. Respecting the tradition, I like to serve it in a flamboyant manner, so I sprinkle it generously with rum, light the top and impress everybody with a restaurant-like, flaming dessert! This “Grandma bread cake” has a comfy and genuine flavor. 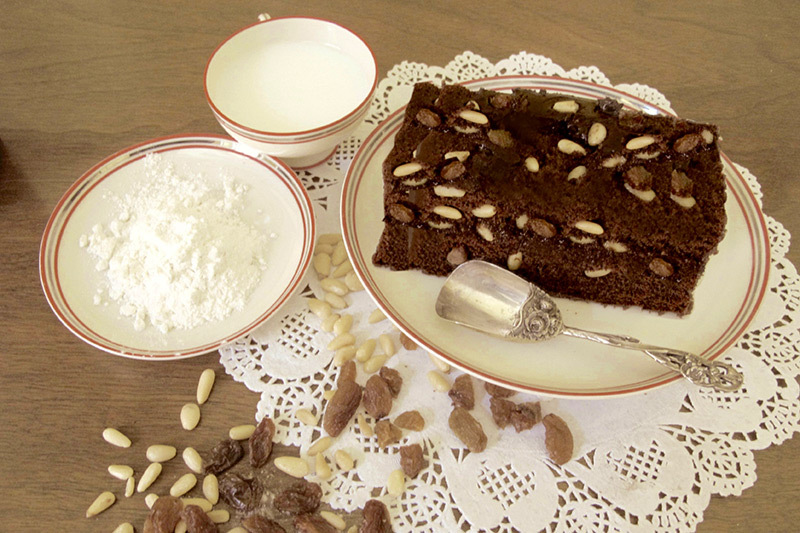 The stale bread is cut into small pieces, mixed with raisins and left to soften in warm milk for 15 minutes. Then it is coupled with sweet cocoa, pine nuts, egg, butter, cinnamon, lemon peel and some amaretti biscuits. This mix is cooked for 50 minutes at 325 F. To check if it is ready, I do like Grandma used to do — insert a toothpick in the middle. If it comes out clean, I take it out, let it cool down, dust the surface with icing sugar and serve. Buon appetito!